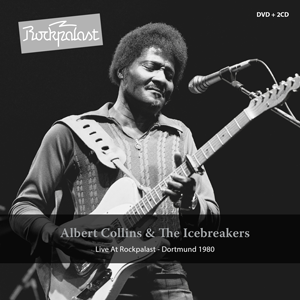 “Live At Rockpalast” CD/DVD is a live recording of Albert Collins and The Icebreakers on the German TV show “Rockpalast.” This package has two CDs and one DVD featuring one of the greatest blues musicians in history. “Ice Pick (Skatin’)” has to be the highlight of the entire concert. It was blues funk at its best. The Icebreakers created a funky groove, and Collins made the Telecaster scream all night long. It almost seemed like the “cold” songs were the best. Imagine that…The Ice Man excelled at “cold” songs. The amazing display of blues continued with “Cold Cuts” and “Frosty”. There was an instrumental jam to close out the show. Albert Collins and The Icebreakers blew the audience away. This is a must see if you are a lover of the funky, boogie blues.